Many visitors in search of their Huguenot ancestors come to Town House to visit one of the early 18th century Spitalfields buildings and to look at its atmospheric panelled interior. Inspired by the tales of the search for your ancestors, I decided to commission a map of the area on which you could all pin your forebears, placing them in context and showing the impact Huguenot immigrants had on late 17th and early 18th century Spitalfields. 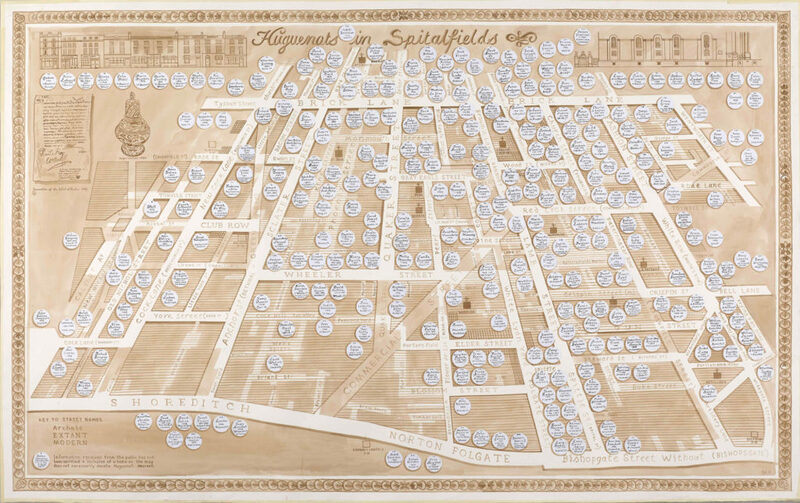 The map drawn by the artist Adam Dant and based on the mid 18th century map of Spitalfields by Roque, has drawn an overwhelming response from all over the world and around 350 names and addresses have been added. Stanley Rondeau unveiled the finished 1.5 x 2.5m map at Town House on the17th June in the presence of many Huguenot descendants of those on the map. Measuring 111cm x 72cm, it is printed on 300 gsm textured, soft white, Somerset paper made at St Cuthbert’s Mill in Wells, which has, very appropriately, been making paper there since the 1700s. The paper is mould-made of 100% cotton rag to exacting specifications and is hand inspected during manufacture. It is a strong, acid-free paper with a very long life making it ideal for framing a fascinating map of Huguenot Spitalfields that can be handed on to future generations. The Huguenot map is now sold out. However, we may print further copies if there is sufficient demand, so please get in touch if you would be interested in buying a copy of the map.